I, Daniel Blake was my first screenplay, I found it quite a fascinating read after watching the film and reading lots of interviews and watching lots of Loach’s other films and writing a film review (another thing done! Whew). I might have done all of this in the wrong order, but I liked seeing where things started and comparing that to where things ended up. I liked seeing where they had stuck tightly to the script, and where actors had improvised lines. I liked how Laverty wrote their lines, disjointed, like speech actually comes. I liked seeing the sections cut, and the pieces added. You get a much better sense of the process of making a film, the collaboration involved — the extras in here, interviews and bios, add even more insight. And of course, as I always love most about reading, you can linger, go at your own pace. Sometimes I resent how films hurtle you through space and time, or like this one, drag you towards an ending you know will momentarily blot out your sun. And of course, it was as powerful, though I didn’t cry quite as much because I find words a kind of buffer between events and my tear ducts though not my emotions. I liked that too. Still, this ending…it gets me. They call this a “pauper’s funeral” because it’s the cheapest slot, at 9:00. But Dan wasn’t a pauper to us. He gave us things that money can’t buy. When he died, I found this on him. He always used to write in pencil. And he wanted to read it at his appeal but he never got the chance to. And I swear that this lovely man, had so much more to give, and that the State drove him to an early grave. And this is what he wrote. “I am not a client, a customer, nor a service user…. I am not a shirker, a scrounger, a beggar, nor a thief… I’m not a National Insurance Number or blip on a screen… I paid my dues, never a penny short, and proud to do so. I don’t tug the forelock, but look my neighbour in the eye and help him if I can. I don’t accept or seek charity. 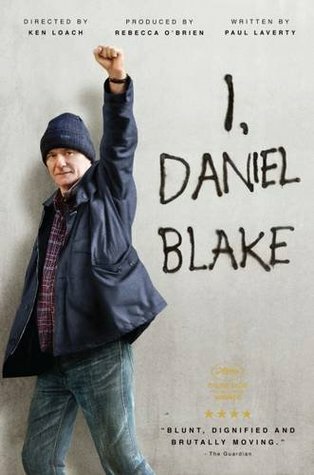 My name is Daniel Blake. I am a man, not a dog. As such, I demand my rights. I demand you treat me with respect. I, Daniel Blake, am a citizen, nothing more and nothing less. Thank you.